Launceston (pronounced Lanson) is the gateway to Cornwall. This ancient market town sits high on a hillside astride the old A30 and stares across the Tamar Valley into Devon. 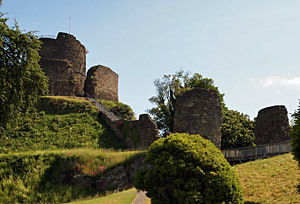 Once the only walled town in Cornwall, Launceston retains its old Norman Castle and part of the town wall including the South Gate. The original name was Dunheved (Old English for Hill End) but when the nearby St Stephen's Abbey was moved into town it brought its name Launceston with it (Cornish: St Stephens). In Saxon times there was a royal mint and the town was capital of the Earldom of Cornwall until replaced by Lostwithiel in the 13th century. 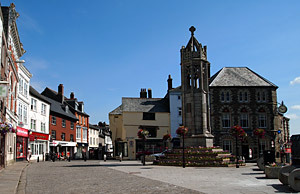 It later became the county town until Bodmin replaced it in 1835. Launceston is said to have been chosen for these functions because of the difficulty English officials would have found in travelling further into Cornwall across the waterlogged tracks of Bodmin moor. Today Launceston is the main shopping centre for the surrounding areas of Devon and Cornwall and the narrow winding streets have plenty of shops, cafes, restaurants and takeaways. Cornish Fairings, a type of spiced ginger biscuit much enjoyed in Cornwall, are said to have originated in Launceston at the "maid hiring" fair held the week after Christmas. This would be where servants were hired for the coming year and various sweetmeats enjoyed by one and all. Launceston's Norman Castle, which still dominates the old town centre, is of motte and-bailey construction and was built by Robert de Mortain, half-brother of William I around 1070. The castle was strategically important as it commanded the river crossing in and out of Cornwall and today panoramic views can be obtained from its elevated vantage point. The Lawrence Museum has an interesting collection of historical artifacts and is housed in a fine Georgian house built in 1753 and now maintained by the National Trust. The Southgate Arch stands at the top of Blind Hole on Southgate Street and is the only remaining gateway of the original three entrances to the old walled town. The arch is Early English and two rooms were constructed above it at the time of Edward VI, son of Henry VII. A castellated parapet and a pedestrian arch were added in 1887 and today, Southgate Arch incorporates an art gallery. The Launceston Steam Railway uses a narrow gauge track and rather quaint steam locomotives to run from Launceston to Newmills Farm Park some 2.5 miles (4 km) down the line. The railway is built on the track-bed of the old North Cornwall Railway which once ran to Padstow and there are plans to extend the present track. The trains run from Whitsun until the end of October.